According to the leaked benchmark, the Ryzen 5 2500U scores 3,561 single core and 9,421 in multi-core, beating AMD’s current flagship APU, the A12-9800B, by 54% in single-core score and an impressive 84% in multi-core score. Based on these numbers, the closest competitor on the Intel side would be the Intel Core i7-7600U which scores 4,736 in single-core performance and 9,314 multi-core. 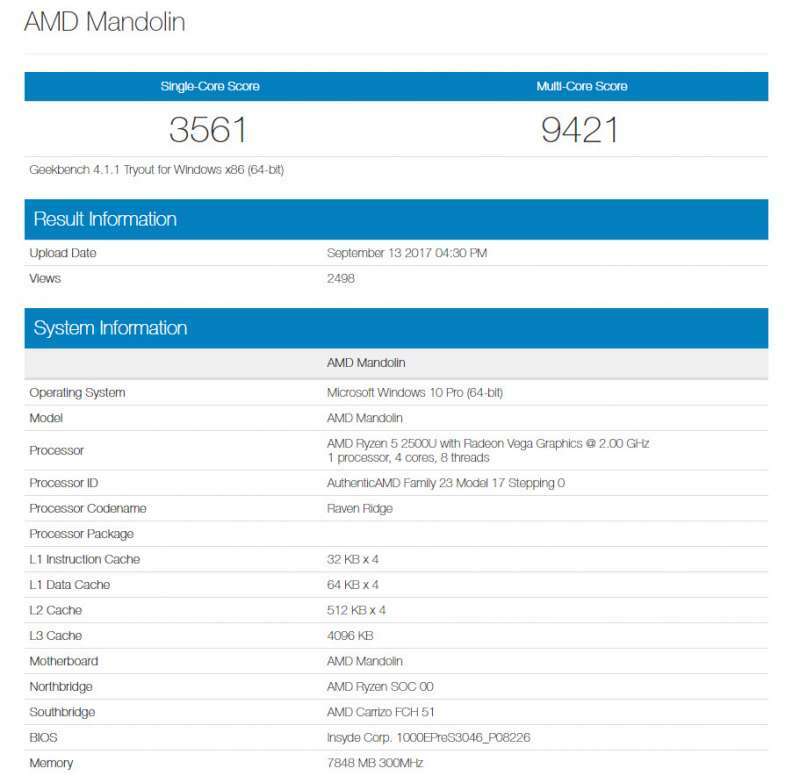 However, keep in mind that the leaked scores of the AMD Ryzen 5 2500U are still from unreleased versions of the processor that’s not yet finalized for retail. The the Ryzen mobile series marks a monumental update to AMD’s mobile processor line. AMD’s current Bristol Ridge APUs, based on the dated Excavator cores, aren’t even close to being competitive against Intel’s current generation products. The new AMD Ryzen APUs take advantage of the newer 14nm FinFET manufacturing process, a completely rehauled processor architecture and AMD’s new Vega graphics architecture. AMD’s Ryzen Mobile APUs are expected to launch in 3Q2017.